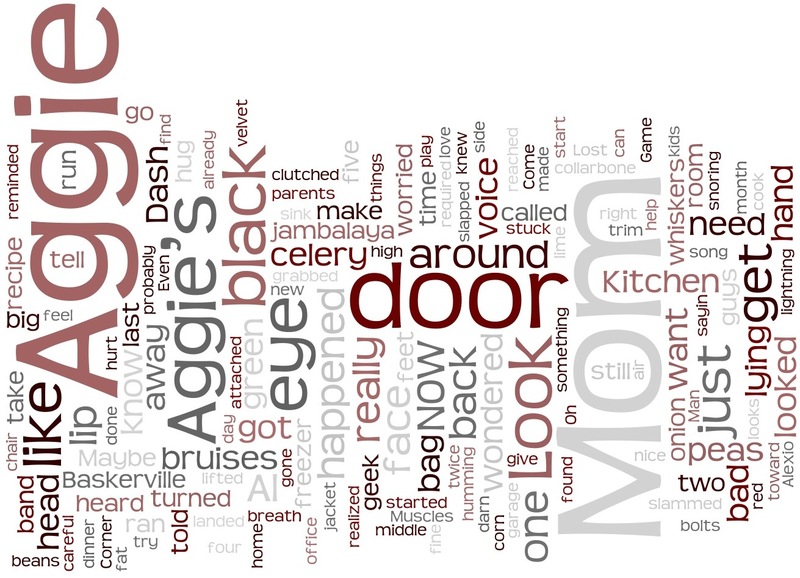 This is a graphic representation of the first chapter of my young adult mystery work-in-progress BLACK AND BLUE. Can you tell by looking at this what it’s about? Who the characters are in this scene? The setting? 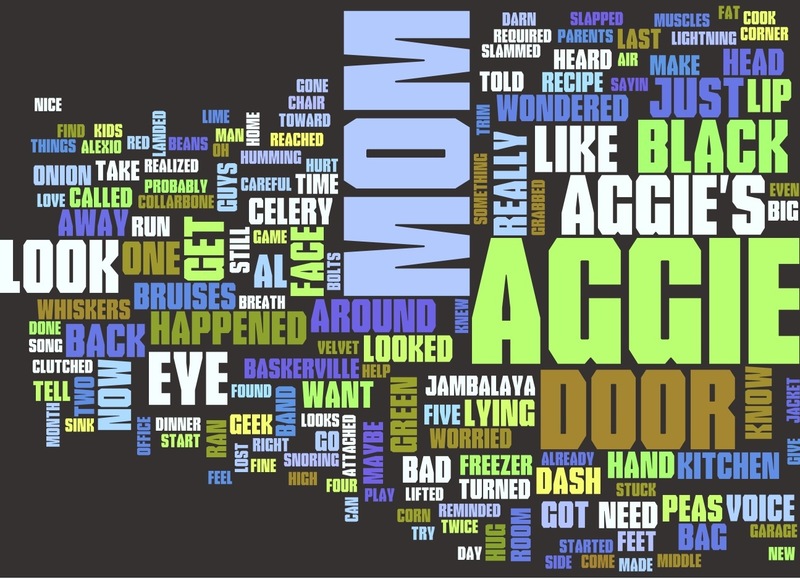 This is from The Coolest Website Ever … wordle. You simply paste in a chunk of text and the website creates a graphic. I became aware of it after the two political conventions. Someone had uploaded the text from Obama’s acceptance speech and from McCain’s and made a graphic in the newspaper. 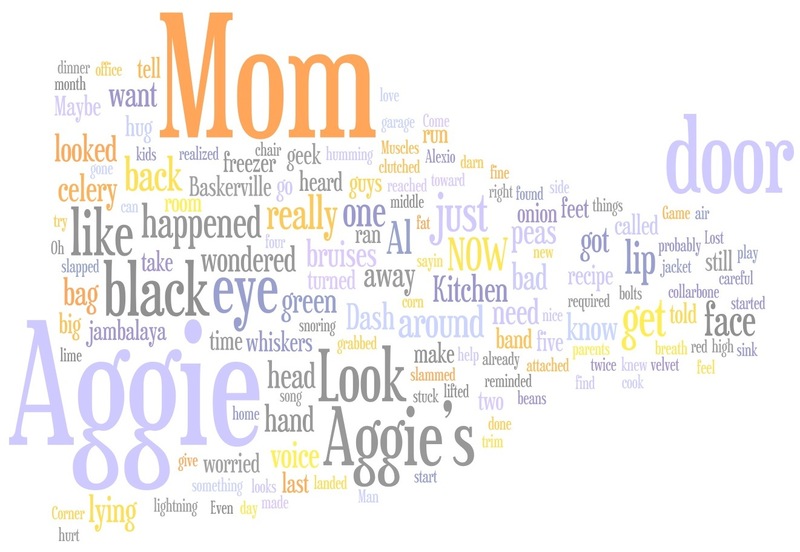 The words that appear the largest are the ones used the most. Writers could use this as a way to check their overuse of certain words. Obviously it’s not all the words in the chapter, just the key words. Here are some more designs …. Cool, eh?! How could YOU use Wordle? 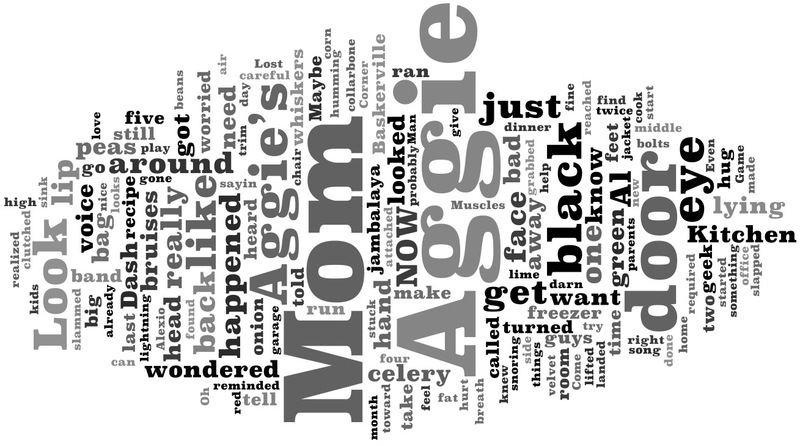 This entry was posted in Goofy Stuff, Stuff Worth Pondering, Writing, Reading and Publishing and tagged Becky Clark, BLACK AND BLUE, wordle on September 17, 2008 by Becky. The designs ARE beautiful, and you are clearly (a word I over-use in everything I write) a true writer, messing around with this baloney instead of writing. 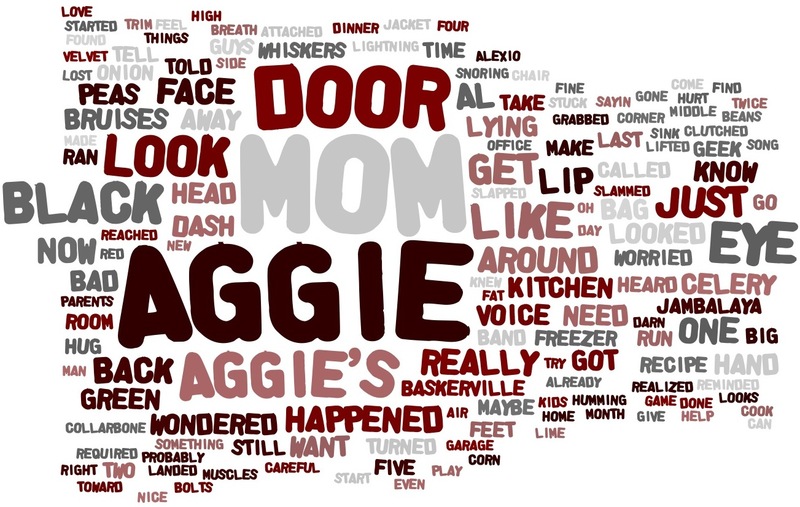 What I must know, though, is why are mom and Aggie dealing with that DOOR so much? Does it get slammed a lot? Blown off its hinges by a shotgun? It’s a YA novel, so I’m guessing it’s the slamming. And then I see, among the scramble of words, the tiny instance of “beans,” which is used, clearly, fewer times than the word “peas.” You should see if they will let you use one of these designs on your book cover. Oh, and while I’m at it, clearly (see?) you should use the word “band” more. It’s not nearly big enough. I like the next to the last one the best, I think. Actually, if I saw this as a bookcover, I wouldn’t have guessed it was a young adult book. Too many food words and kitchen and mom. 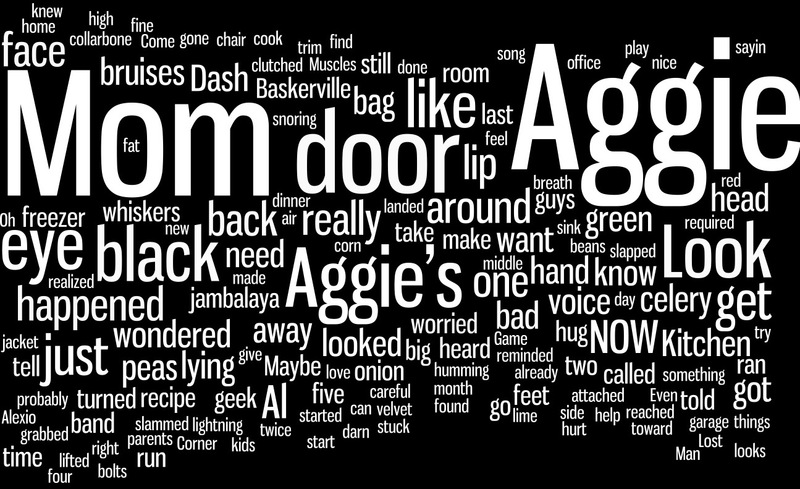 And around where I live, Aggie = Texas A&M University. Overall, it’s an interesting book cover design, though. The mix of words does look YA. I’d just pick more YA sounding words to put up there. George … thank you for saying what a fabutastic writer I am. What? You didn’t say that? Well, thanks anyway for saying it sometime in the future. Hi Helen … I don’t think I’d ever use this as a book cover. Way too busy. And I don’t chose the words. 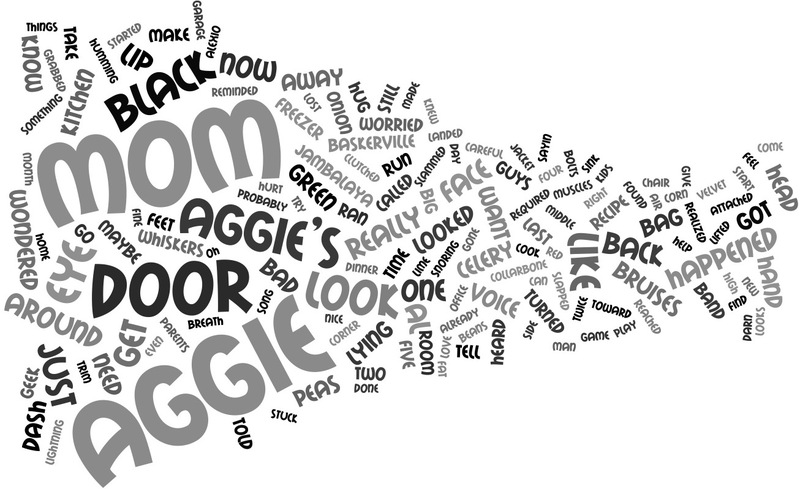 Well, I do, in a roundabout way because this is my first chapter pasted into the wordle site, then voila! Out pops this picture. The bigger the word, the more it’s used. 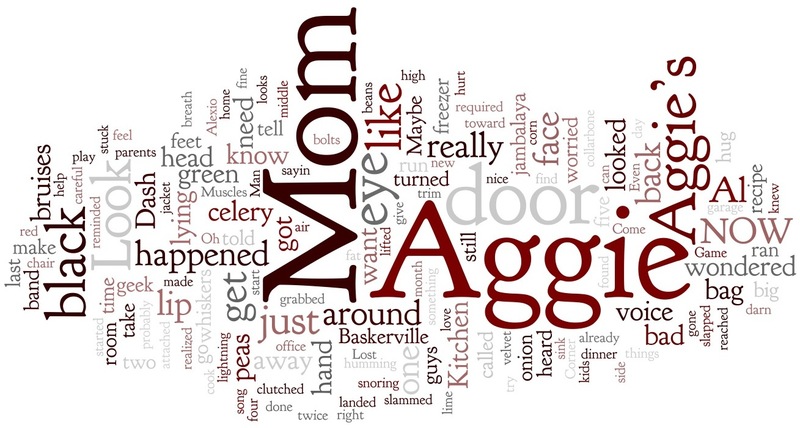 Funny about Texas A&M, but Aggie is short for Agatha, the main character’s sister. If you could peek inside my brain, you would find my ‘to do’ list looks an awful lot like these designs. Hee Hee. I’m one of the few, the privileged, the most fortunate of writers…. I’ve read the book. The whole book, not once, but twice! I predict it’ll be a best-seller. Go ahead and reserve your copy now, if it’s possible to reserve before a publisher even buys it. Wonderful word graphics, Becky. I’ll have to try that site on my own first chapter. And yes, real writers are among the world’s best procrastinators. Like commenting on blogs instead of revising. I’m giggling too because I’ve also read the book, and various drafts of it at that! This is a really cool tool to use – I think my favorite one has the green color scheme. 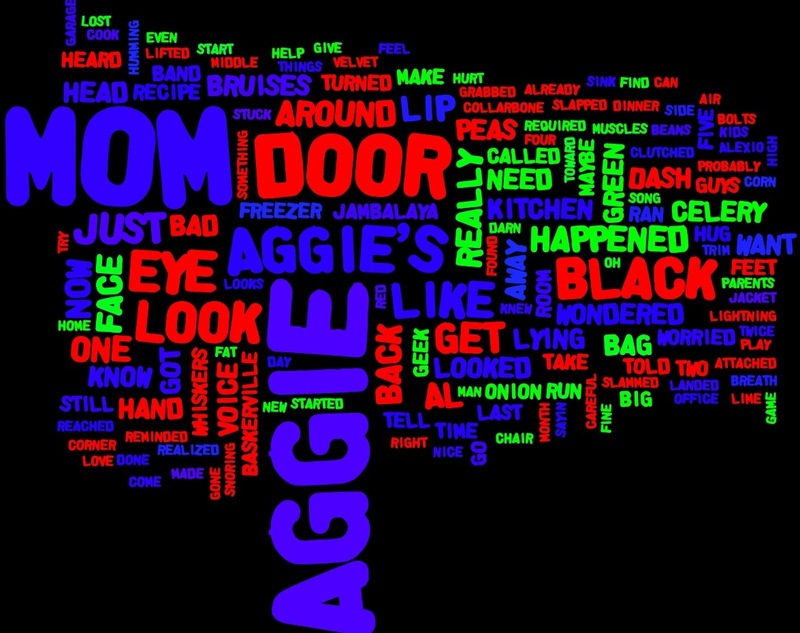 It’s also a good way to get people interested, since there are really random words (Aggie, get, happened, black, door)that are bigger than normal ones (careful, velvet, stuck, geek). Rock on! LOL, Wendy! I’m a more linear thinker (when I actually think, that is) but in elementary school my kids were taught that “mind mapping” dealy which is really just stream of consciousness written down and linked by lines and circles. I kinda got into that, even though I prefer diagramming sentences. But it does explain so much about you! Lisa, you are too kind. Have you been tilting back the schnapps this early? 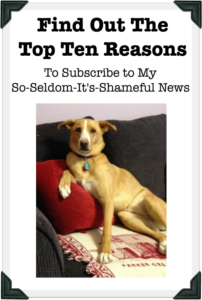 And don’t dismiss commenting on blogs as not writing. I see several words, with actual sentences and punctuation. I vote for you being a Real Writer. And a procrastinator, but still…. I think I like the fifth from the bottom, Jessica. I like the colors and the font, but I don’t have to twist my neck into a pretzel to read it. YOU rock on! Thanks for posting about Wordle. What a great tool to analyze one’s writing. I love your blog and welcome to the kidlitosphere! Thanks, Susan! 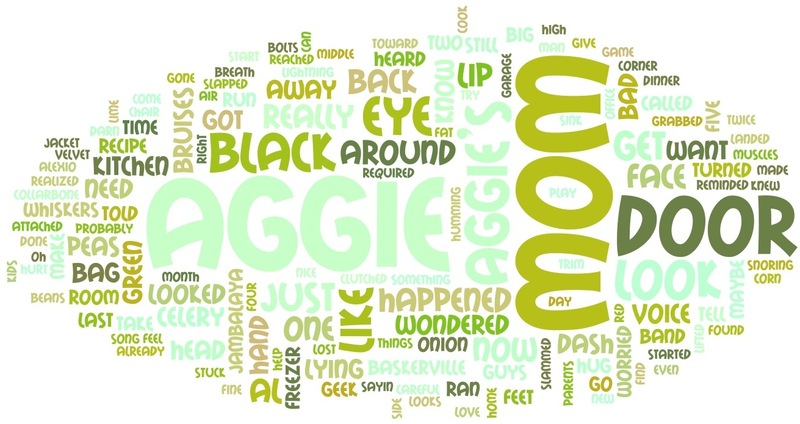 I just thought Wordle was funky and fun and purty. Then one of my smart friends (Hi, Kim!) pointed it out as a tool to use in our quest for the perfect manuscript. But it’s still funky and fun and purty.